[Discontinued in 2013] I have a confession to make before I start this review: I've never had Starbucks coffee, in fact, I've never had coffee in my life. I rely on chocolate as my sole source of caffeine, though I did once eat a coffee bean, does that count? That's right, it's the rogue punk of the over caffinated bunch. It's a Hot Chocolate ice cream mixed amongst the javas, coffees, espressos, lat-ti-do-das of the very limited Starbucks ice cream line. Just like if you go to the store, there are some check boxes on the left hand side of the pint. You can't see it from this shot, but the checked box says "Not Coffee". This little pint is so special they don't even take the time to mention it on their website! You know, that's just cold .....doh, no pun intended! I just hate when a flavor isn't listed on a company's website. It means it's either brandy new, discontinued, or just, well, unloved I guess. No matter what it means, it always irks me. Sorry, brain wandering. Now at first thought, you might have suspected it was just going to be hot chocolate flavored ice cream, but not so. 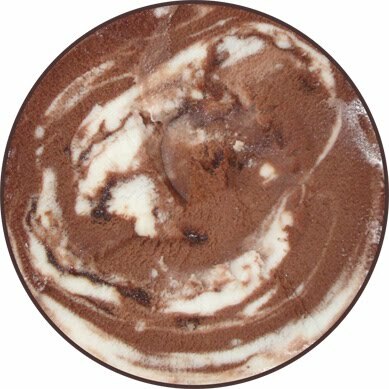 The exact description is "swirled chocolate and vanilla ice creams with ribbons of chocolate fudge". You can see from the picture that there is more chocolate than anything, and the fudge ribbons are well, not so ribbon-y, but they are scattered all about (the dark spots in the image above). I had been saving this for a special occasion, and quite frankly, I had this underlying hope it would knock my socks off. It's got the price tag of a quality ice cream, so I set my expectations fairly high, maybe too high. It's definitely quality, and I like what I'm tasting, but, I'm just not impressed. It doesn't make me think of hot chocolate at all, and darn it, I'm a stickler for names. If you are going to call an ice cream something particular, it better taste like it, and this hot chocolate just doesn't like hot chocolate. Maybe it was unrealistic to bring a "hot" flavor to ice cream like this, the "hot" is what separates hot chocolate from regular chocolate milk, so how do you possibly convey that over to the customer in a frozen form? I guessing I'm saying that in retrospect, maybe they shouldn't have tried since they were doomed to fail. This just happens to be another well made flavor that I can't give my total approval too. Starbucks is distributed by Unilever now (the owner's of Ben & Jerry's), so I expected a well made ice cream, and I won't mind finishing it off, I just wish it tasted like hot chocolate ....or at least throw in some mini marshmallows or something to spice things up. 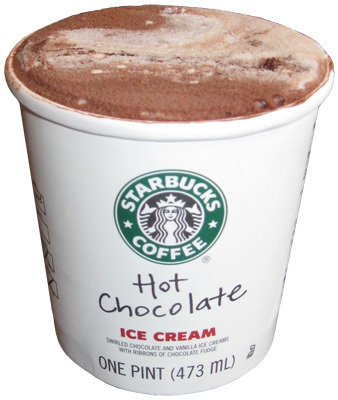 Starbucks ice cream was introduced in 1996 and was distributed by Dreyers. However, in 2008, Starbucks entered into an agreement with Unilever and on March 24, 2009 they announced the first set of new flavors. In the summer of 2013, they have decided to cease production. On Second Scoop: "It's utter decadence - and Starbucks - by the spoonful". There is no arguing it's quality, and I know you won't hate it, it just won't wow you or make you go running off to try a Starbucks Hot Chocolate. Not to go entirely off-base from the "hot chocolate" (which I totally understand by the way) but you've NEVER had coffee?!? That's amazing! I can't find numbers for how many people have never had coffee but....about 60% of adults admit to drinking coffee daily and another 18% do it "occasionally". That means there are roughly 22% that don't drink coffee but I'm sure almost all of them have at least tried it. I'm not passing judgment :P I'm just amazed! Now that would make an interesting review....the day you try coffee...if it happens. ...and personally, coffee ice cream to me bears no resemblance to actual coffee (with few exceptions) and is a different beast entirely. hehehehe, strange, isn't it? The closest I've come was when Arby's would mess up and give me a mocha shake instead of a chocolate shake. Oh how that drove me nuts. I would go home and dump in a ton of Nesquik to try and cover the flavor. oh, cool post by the way! I've been waiting for you to review the Breyers Reese's Cup ice cream! oh geez, I forgot all about that, let me see if I can't find a container and get it on the site. I thought thats what happened! Once you taste it you'll be addicted.